Jess and I have been talking about testing ourselves with a longer, tougher hike before winter changes things too drastically. With my mother visiting and able to bring Evie to gymnastics, we decided this weekend was the perfect chance to give a longer outing a try. We departed for Wachusett Mountain State Reservation in Princeton, MA, home of the famous Central MA ski area. We had been pouring over trail maps and plotting a route that would take us around the mountain before going up and over. We knew we’d be looking at several hours of hiking and so packed a lunch and more water than usual. We parked at the Visitors’ Center, loaded nearly to capacity with cars on this beautiful fall day, and started on the Bicentennial Trail. 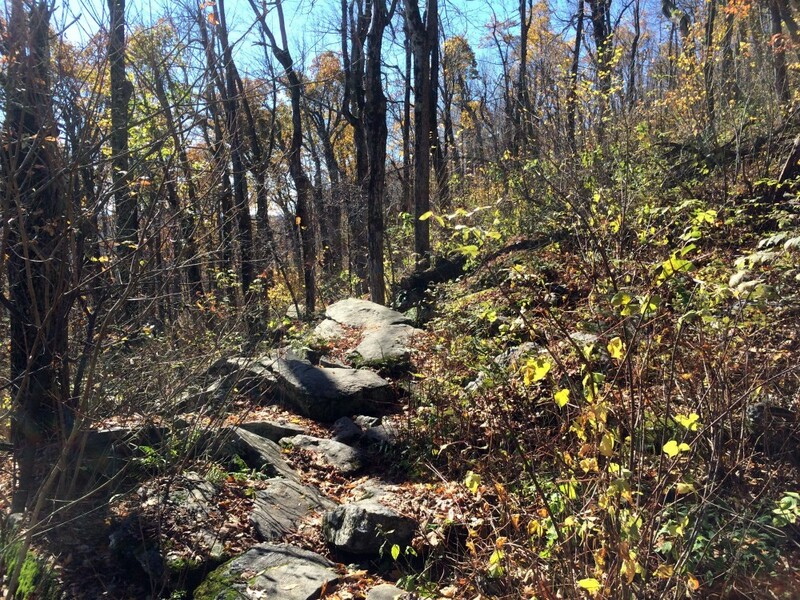 The trail started off wide and easy, with large stone steps and a gentle ascent. We were accompanied by many other hikers, large families and couples and groups of boisterous friends. It was odd to be sharing our hike with so many other voices. Soon, a steep trail (Pine Hill Trail) forked off towards the summit, but we continued straight on Bicentennial. The trail immediately grew both quieter and more rugged. The flat areas disappeared and we had to step from stone to stone, but the overall elevation change was still subtle. To our left, occasional breaks in the trees showed the beautiful views of the surrounding countryside. We crossed many small streams – and often the trails and runoffs shared the same channels down and around the mountain, so our rocky paths were shared with running water. This made the rocky areas slippery with either water or wet leaves, and the less rocky areas were often quite muddy. After an hour or so, we broke out of the forest and into the top of a broad open meadow on the hillside. There, we ate our lunches and reassessed our plans, fine-tuning our route now that we had more of an idea of what the terrain was like. From there we took the High Meadow Trail up the mountain to Jack Frost Trail, and continued upward from there. The ascent was steeper here and steady as we approached the summit from the south. Our legs were in shock at the surprisingly steep sections we were hiking. 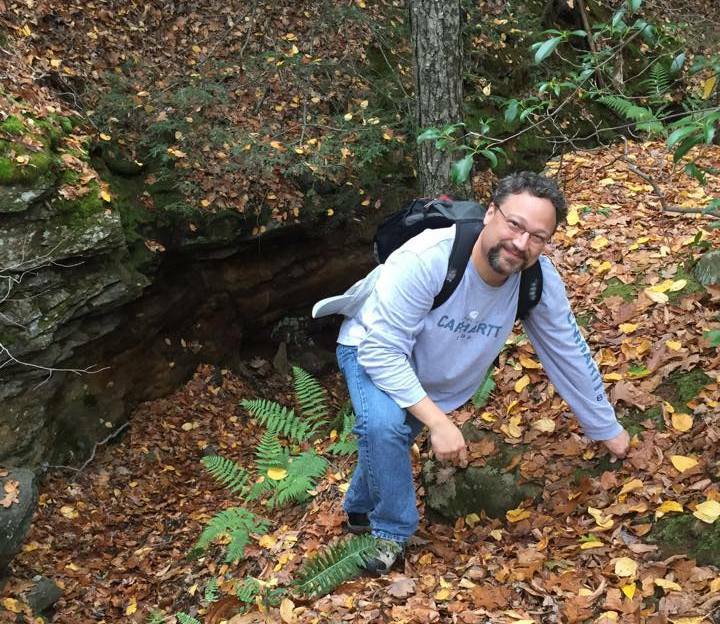 I was definitely humbled by this part of the hike; I had thought we could handle a six to eight mile hike on Wachusett because I had done over six miles at Wells State Park a couple weeks back. But this was a whole new type of hiking and my legs were not happy. We turned west on the Link Trail, and continued west towards Semuhenna Trail. 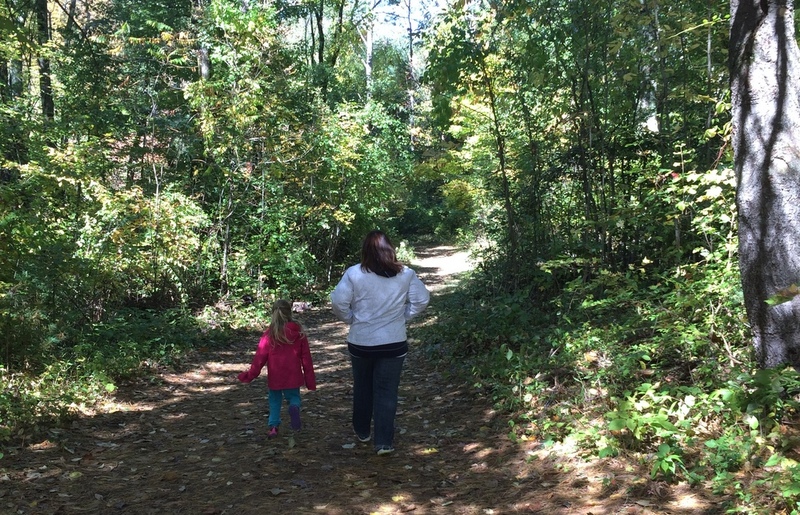 This trail’s unusual name is the result of spelling Anne Humes backwards. The trail took us further from the summit but the terrain was among the best we’d encountered so far: still rocky and challenging at times but also with nice stretches of mostly-flat wooded paths. Two hours into our hike, we realized that if we followed Semuhenna all the way to Balance Rock and then hiked back up, our legs would be in rough shape for the final descent from the summit. We made a choice to turn from Semuhenna to the West Side Trail and begin approaching the summit again, this time from the Northwest. We soon turned onto Old Indian Trail and begin the challenging climb up steep switchbacks towards the summit. After its initial burst of altitude, however, Old Indian Trail levels off and approaches the peak at a much more civilized grade. We left the trees at the top of the ski lift, and took the path to the top. There, exhausted and weakened by our climb, we drank water and examined our maps (and took selfies, of course). We decided we had done enough; our bodies were wearied and we wanted to end with smiles on our faces instead of frustrated and dismayed. So we took the most direct route down, scrambling the half mile down Pine Hill Trail back to Centennial. It was the steepest climb we’d had so far, 600 feet of descent in half a mile, down bare wide rocks with flowing water on them which had to be approached with care. Several times my legs almost betrayed me, but I managed to grab hold of trees and keep from an embarrassing and painful fall. After what seemed an eternity of careful descent, we finally arrived back where we began, on the flat easy section of Bicentennial Trail. We followed it back to our car — three and a half hours of hiking (and resting), five miles of travel by the GPS’s accounting. It’s definitely the most challenging hike we’ve tackled. 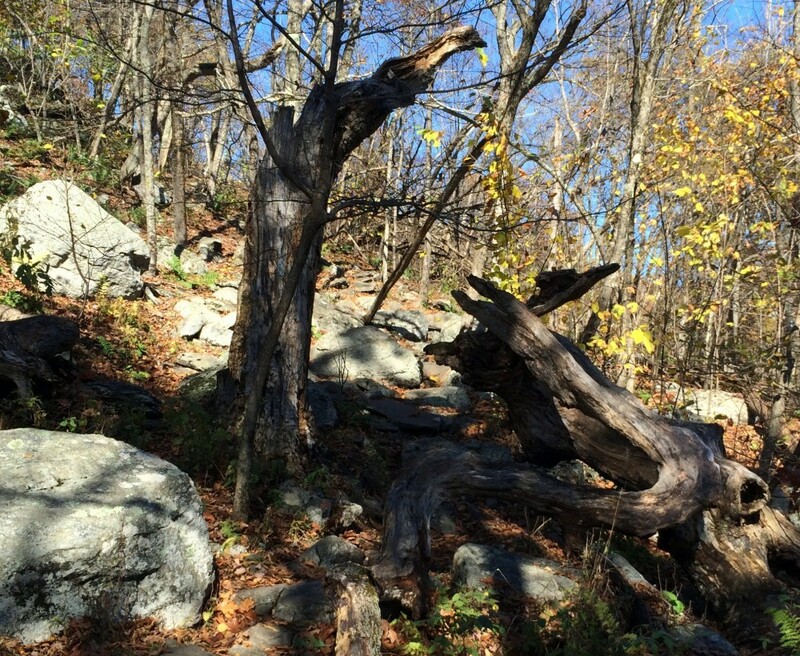 We learned a lot about why mountain hiking is different from other hiking. 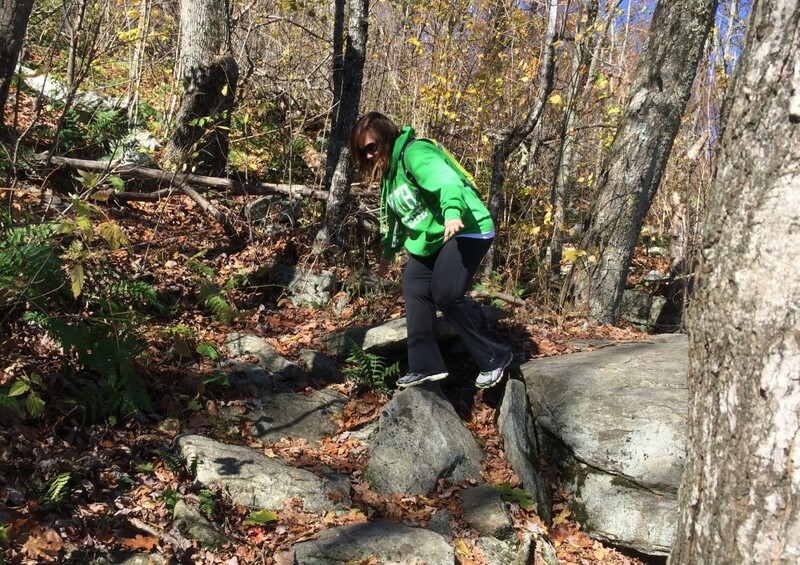 I learned that I won’t attempt another hike with so much climbing in it while wearing jeans — not a pleasant time! 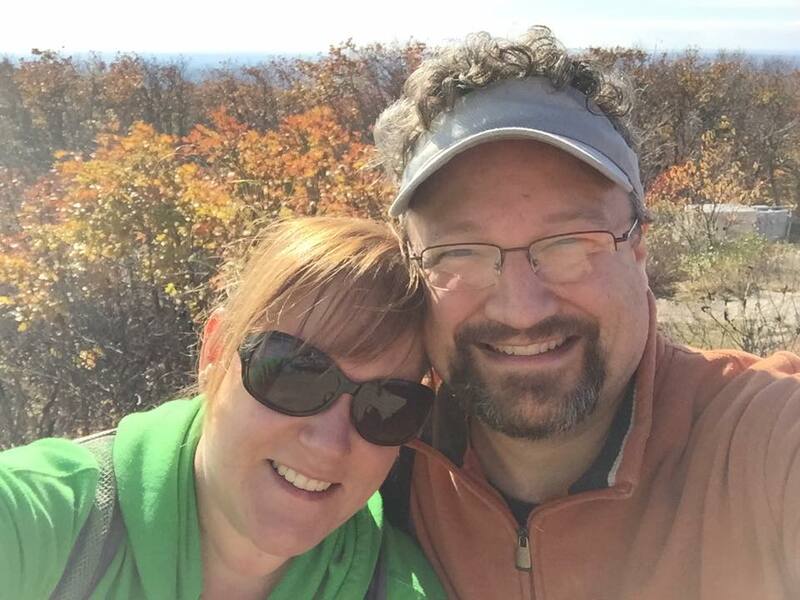 And we learned that one of the advantages of a place with so many criss-crossing trails is the ability to refocus the hike based on the circumstances. 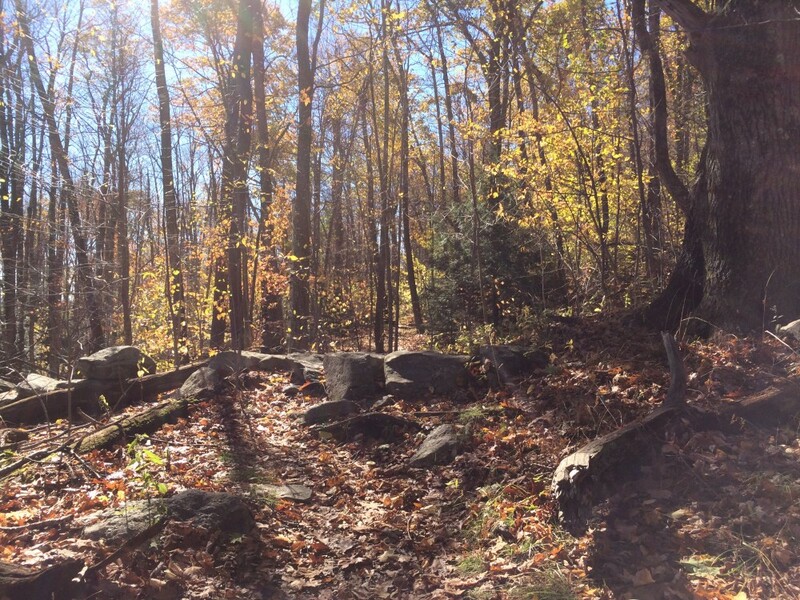 With 17 miles of trails and many landmarks to see, we have plenty more to see next time we decide to visit Wachusett. 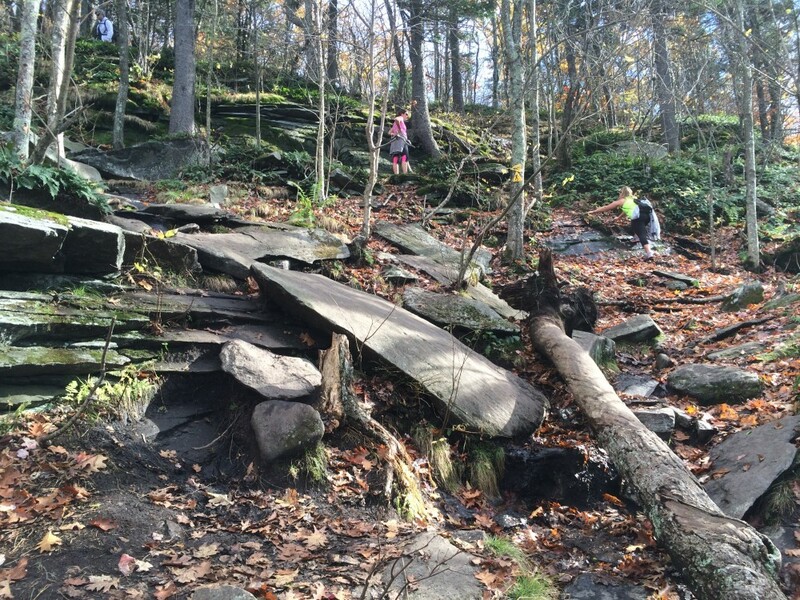 After a rainy week, we knew the trails might be a bit muddy and slippery with fallen leaves, so we opted for some easier locations this weekend. With Evie safely handed off to Saturday gymnastics, we stopped for lunch at Soup to Nuts in Sturbridge. They’re a cozy lunch spot with a limited menu including a rotation of homemade soups and quiches. Even though I’d never heard of it, they’ve been in business 31 years. Shows what I know! Fed and ready to explore, we stayed local and headed down Leadmine Road, intending to visit Tantiusques, a Trustees of Reservations property down the road from the Leadmine trails we had previously hiked. Following the Trustees’ directions, though, led us nowhere fast; Leadmine Road became a basically impassible dirt road (at least in my hatchback) thanks to deep ruts, wide puddles, and heavy fallen leaf cover. 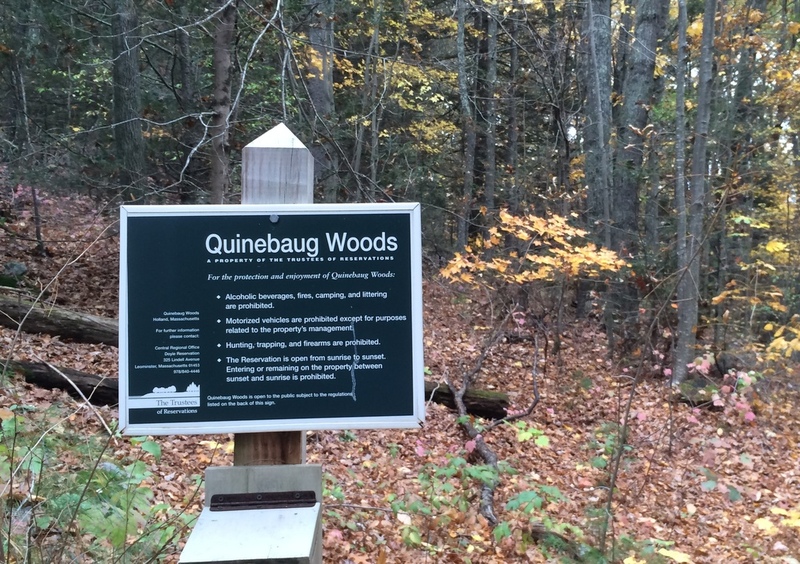 After debating for a bit, we took side roads over to Holland and found Quinebaug Woods instead, another Trustees property. 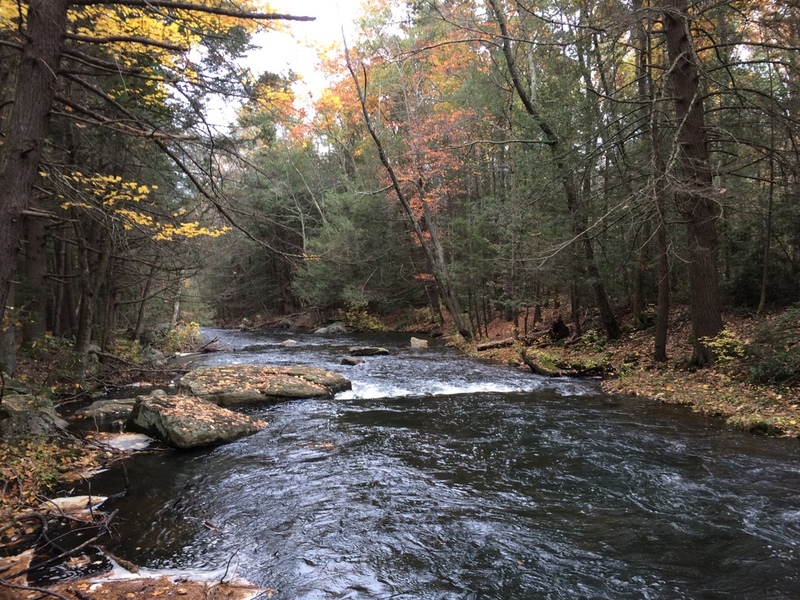 Quinebaug Woods is a narrow parcel nestled between private property and the Quinebaug River. 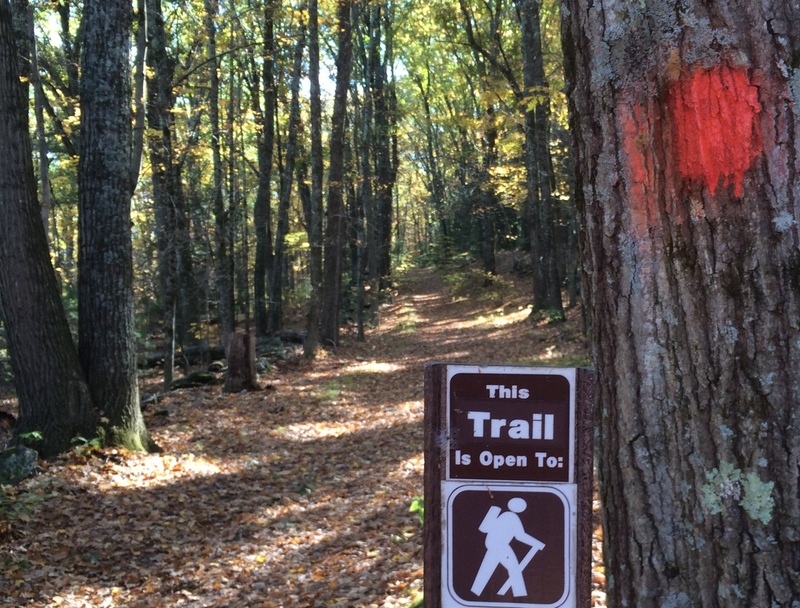 A single trail goes on a brief 1.1 mile loop. It starts along the river (fishing is allowed, and someday I may return with a fly rod) and then takes a short steep climb up. After the climb, it’s a meandering walk along rocky paths back to the trailhead. 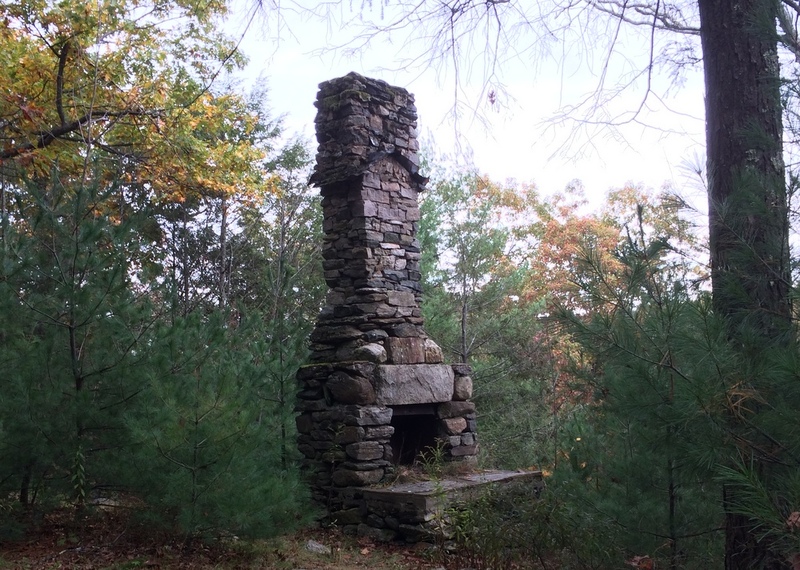 Along the way, we stopped at the old chimney, all that is left of a 1930s cabin on the property. It’s impressively large for what must have been a tiny cabin (there is not much level ground here!). After completing the loop, we looked at our maps (on our phones, of course) and figured out we could take a back way across to Tantiusques from where we were. So we made a quick drive back into Sturbridge and approached the site from the opposite direction. The road was paved, well-maintained, and wide. I have no idea why the middle section of the road was such a disaster. Tantiusques was similar terrain as the trail we had just completed, with a similar 1 to 1.5 mile trail loop on it. The interesting aspect of this property is its mining history, dating back to pre-Colonial times. 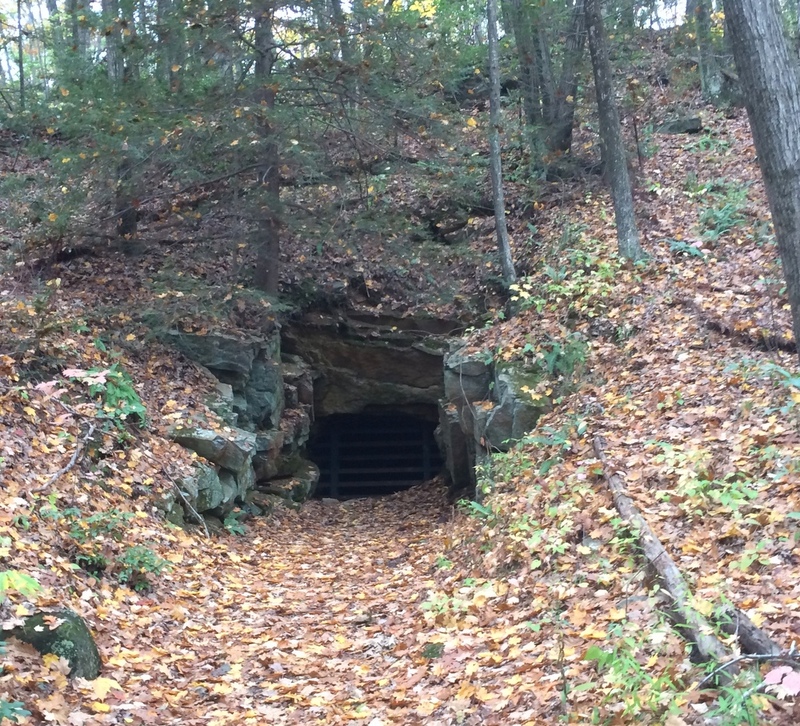 The mining stopped in the early 20th century, and there’s ample evidence of the mining all around, including this 1905 mine entrance which is fortunately boarded up (but still plenty creepy looking). Most of the mining on this property was not underground, though. The miners simply cut into the earth, exposing the graphite and other minerals. 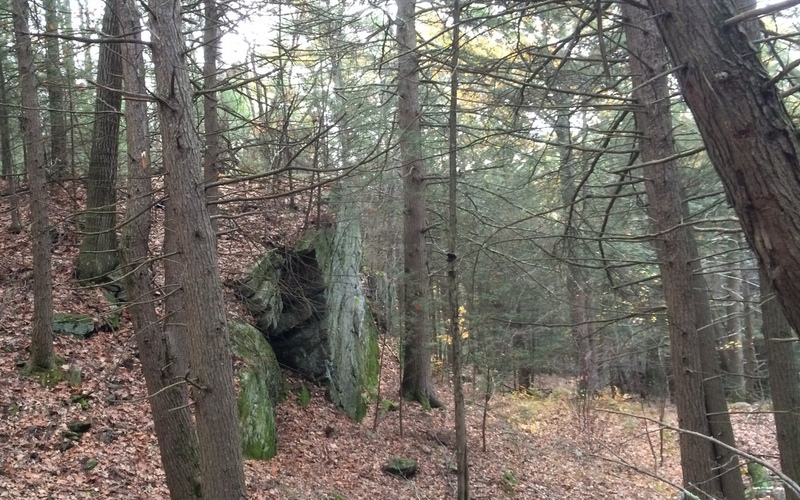 Much of the hike was along an old ridge that had been cut open and partially refilled. There were ample opportunities to look into nooks and crannies of the old mining cuts. We somehow missed a cutoff which would have returned us to the trail head, and followed a side trail which took us out to the road, meaning we had to walk a quarter mile down the road to return to our car. In both these cases, the properties were obviously not as well-traveled as our other trails. Trail markings were not as clear,probably because the parcels were small and the trails simple one-mile loops. 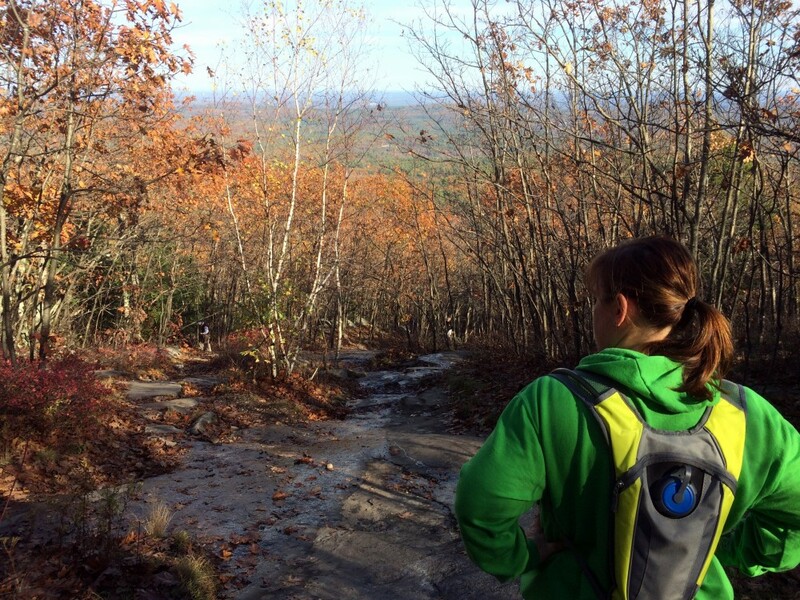 But we still felt lucky to experience two great hikes in the middle of this beautiful New England autumn. 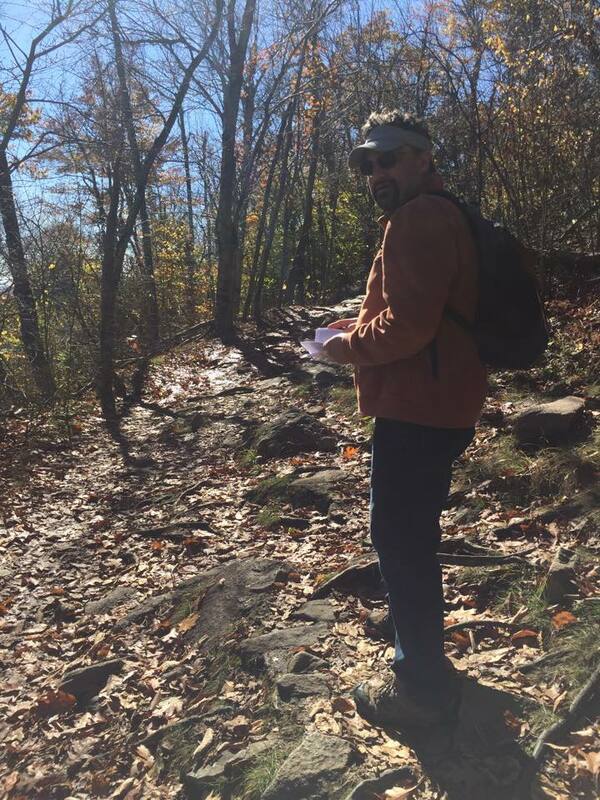 With my wife and daughter out of town, I had to make a decision on how to spend my Sunday afternoon: watching the Patriots beat up on the Bills, or hiking on a beautiful sunny October day? Fortunately, I have the technology available to solve this problem — a DVR! Safe in the knowledge that I could watch the Pats any time on this Sunday, I was free to explore other options. So it was that after a morning spent with friends at Hamilton, I parked the car at the main lot for Wells State Park, where my wife and I had recently hiked, for another visit. 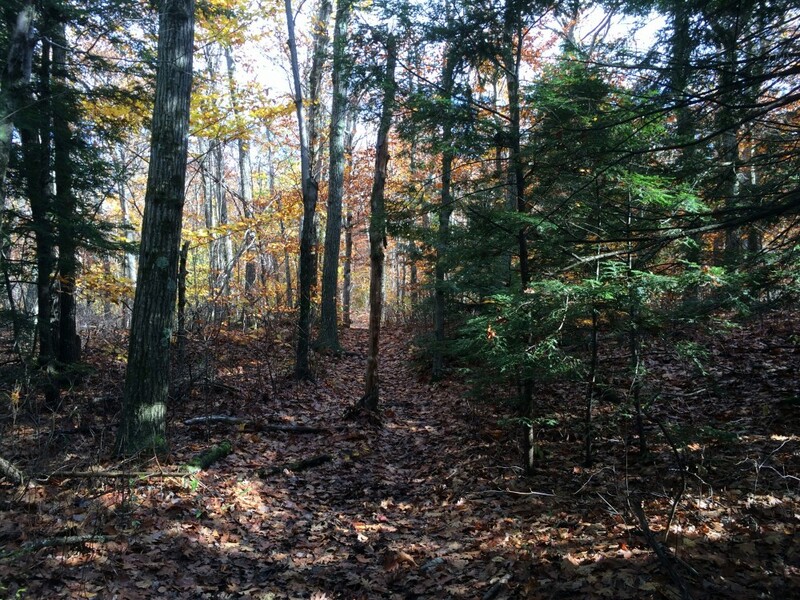 I decided on this trip that I wanted to uncover the two trails we had skipped on our recent visit — the South Trail and the Mountain Road Trail. 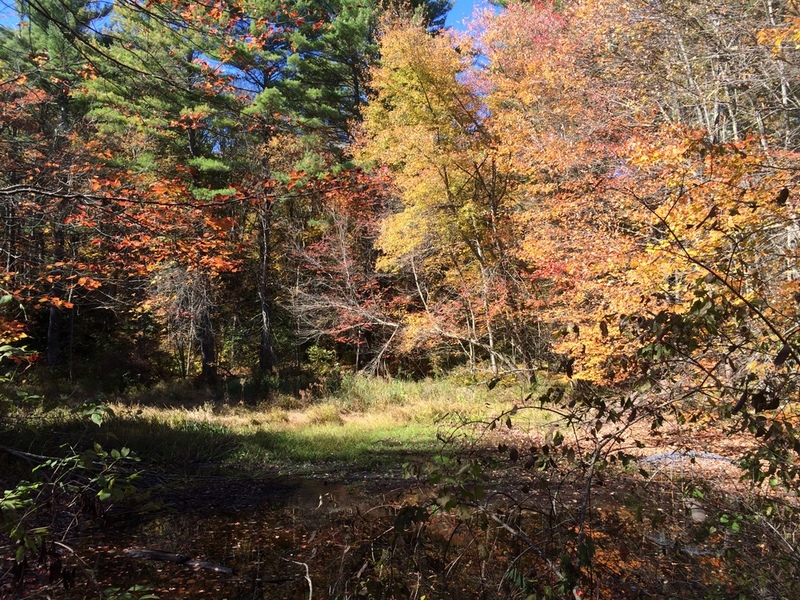 To start, I warmed up on the Mill Pond Loop (the accessible trail), an easy mile with incredibly bright foliage surrounding the small ponds. From here, I climbed up the steep trail which leads to Carpenters Rocks. I took a wrong turn somewhere (it’s hard without my navigator!) 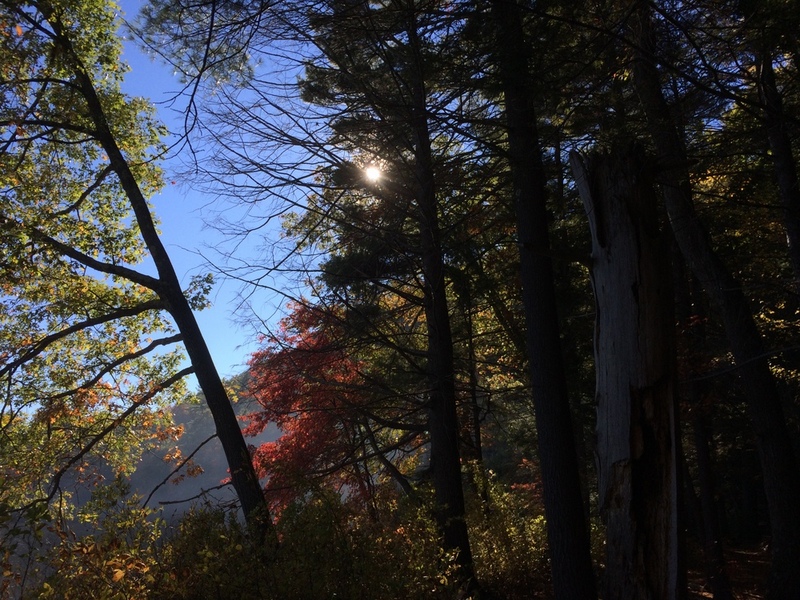 but quickly got back on the trail and made my way to the rocky cliff with its views of the slowly changing foliage. I passed several other hiking groups, families, couples, and groups of friends. At the Rocks I found the cold remnants of a campfire. It seems like a dangerous spot to have a fire, to me, but what do I know? After resting a moment, I continued up the path to the South Trail, which was a totally different beast than the North Trail I had hiked before. Wider and easier, it was a slow descent to make up for the steep ascent to the Rocks. 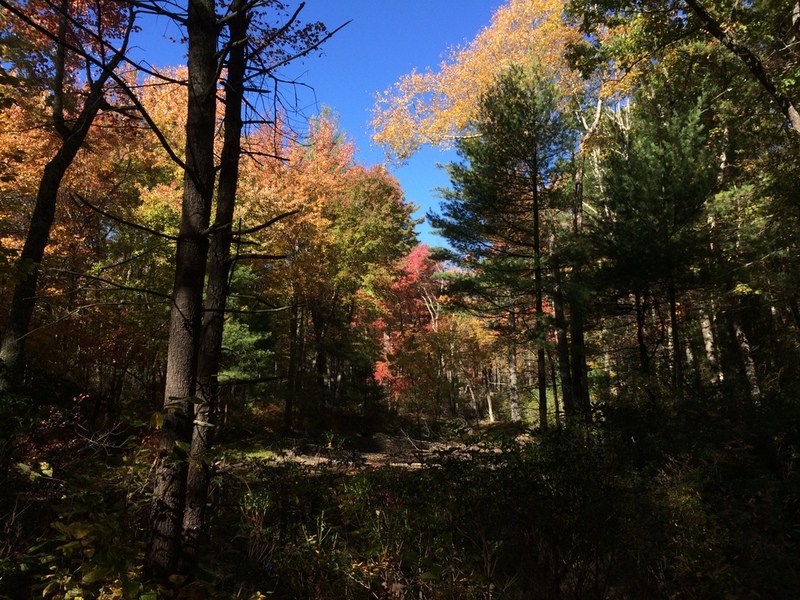 I made a spur-of-the-moment decision to fork off from the trail and head along a blue-blazed trail which leads out to New Boston Road. There, I met up with a father/son group who were just entering the woods. I paused and drank some water while I let them get ahead of me; I didn’t want to be hot on their heels. 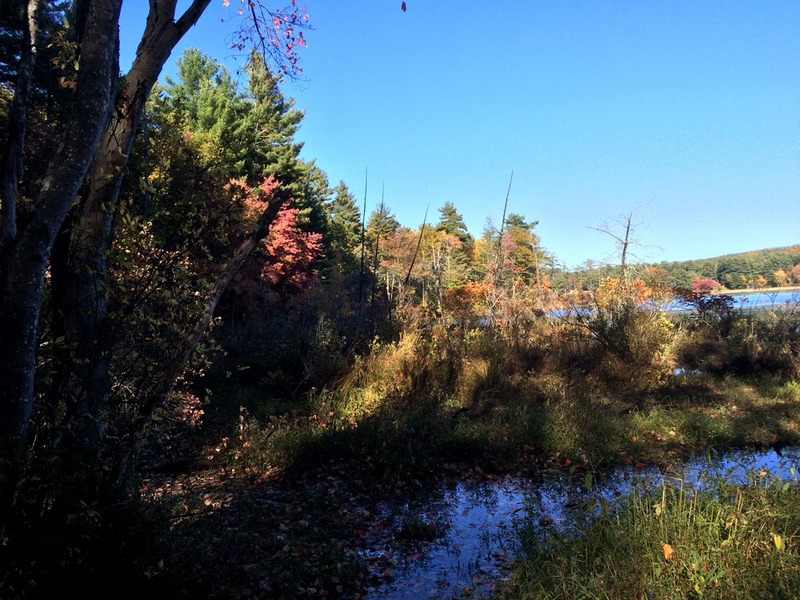 This section of trail has some beautiful spots but bogs down a bit in a marshy area. After giving the family some room to breathe, I followed back up the blue blazes to the South Trail. There, they turned left and I turned right, and I sped up a bit to make up some lost time. The trail ended on the paved park road, and I followed that for a bit while walking past campsites along it. 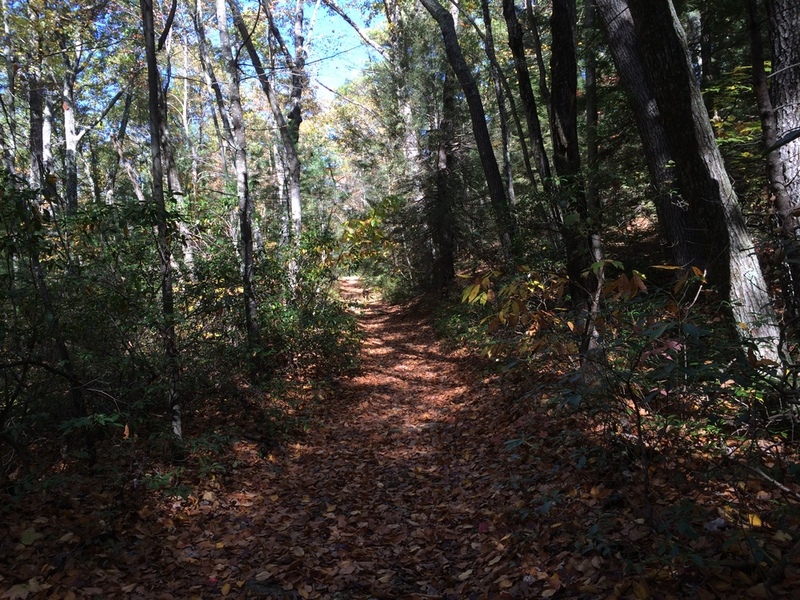 Eventually, I turned back into the woods at the orange blaze trailhead for the Mountain Road Trail. This trail was again, completely different. A slow climb took me through several different types of forests as I got closer to Route 90. I passed several families out for hikes along this trail, due to its proximity to the park’s campsites. As the trail reached Route 90 and took a sharp turn, it got incredibly steep. Making my way carefully down the path I wasn’t sure whether I’d rather be hiking down this grade or up it. Soon, though, it was back on level ground and moving away from the highway. Before long, to my right the views of Walker Pond began to open up. My legs were getting tired at this point, but the incredible views rejuvenated my body and spirit. Eventually, the trail connected back up with the park road, which I followed back to my car. I had a close call with a football spoiler as I walked past a campsite playing the game; I heard something about multiple officials and a possible turnover, but I picked up my pace and managed to get out of earshot before anyone announced the score. When I got back to my car, I learned I had hiked 6.5 miles over some really interesting terrain. It was an incredibly satisfying hike and I was fortunate to have the time to myself to enjoy it fully. 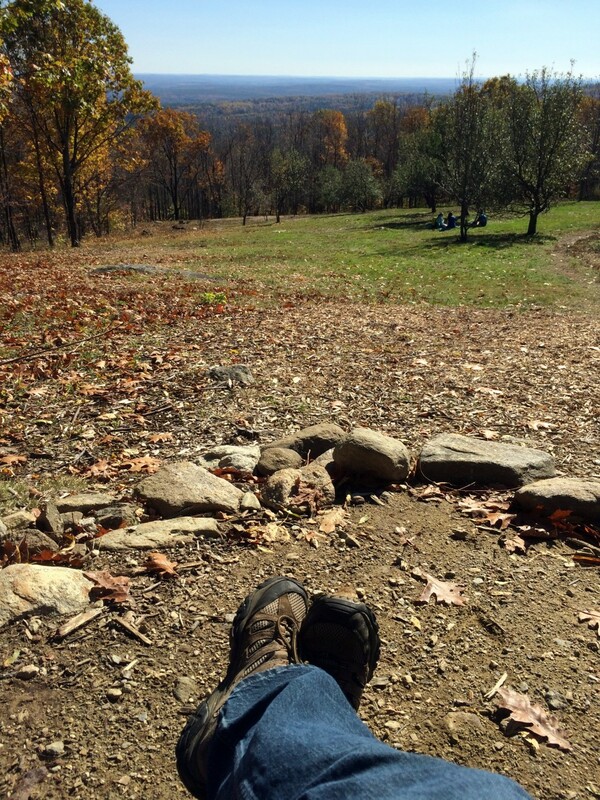 Hiking alone is very different than hiking with a partner (or a whole family). Your mind wanders — work, home, deep thoughts, superficial thoughts, and then … nothing, just one foot in front of the other. Peace. It’s why I go out there. It takes a few miles of physical activity before the brain has exhausted itself of its conscious concerns and the unconscious can take over…. I drove home, watched the Pats win their game, and then sneaked back out for a late dinner at BT’s Smokehouse. Not a bad way to spend a Sunday…. Two trips in one weekend? Definitely! With the weather improving greatly, we decided to take another day hike, this one with our daughter. 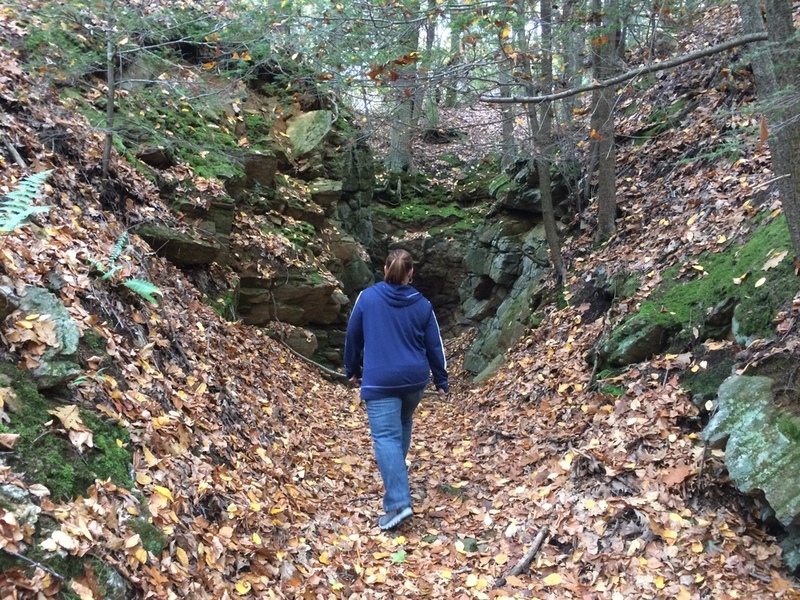 Jess suggested Moore State Park in Paxton, which she had stumbled on in the past when researching hiking locations in the area. We’d driven past it several times when driving North on Route 31, but never stopped. Our daughter enjoys hiking but prefers geocaching to a vanilla hike. Knowing we’re headed to a destination and that once we get there we’ll find a box full of goodies gives her incentive to keep moving. There are several caches hidden at this park, and with that carrot dangling ahead of her, we packed her up and headed North. We parked at the closest parking area to the main entrance, and started by exploring the “Healthy Heart Trail” where a few geocaches were hidden. 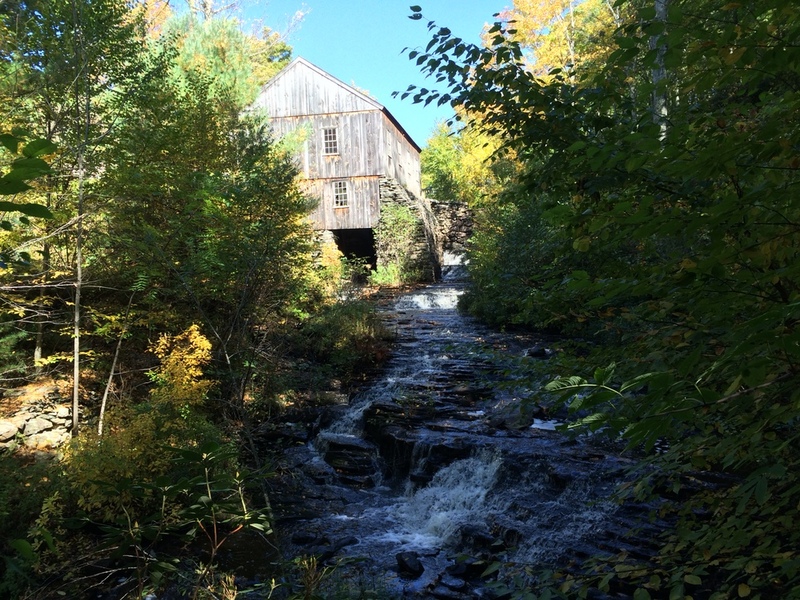 The highlight of this trail is definitely the Old Sawmill at the end. 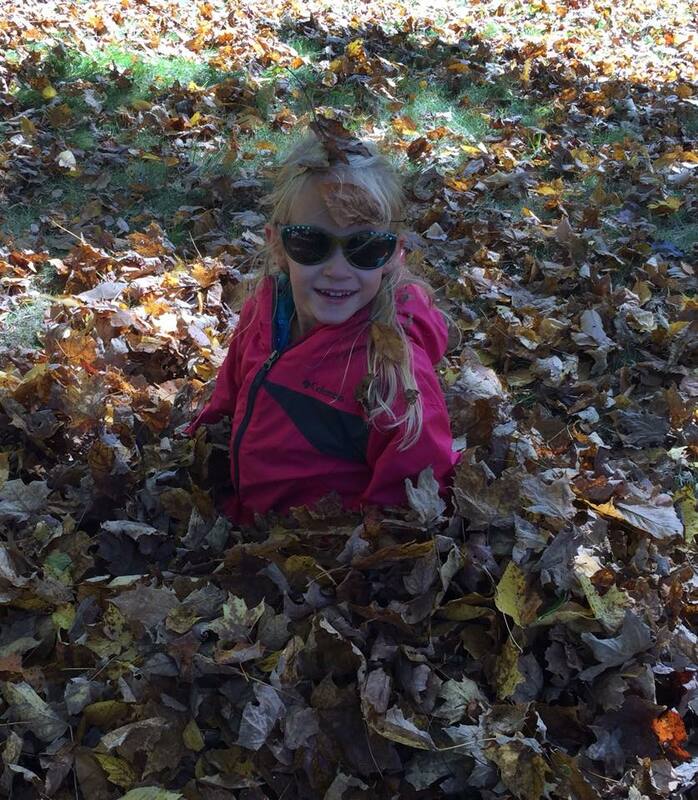 We took many pictures and explored the general area for a while, including playing in the leaves near the dam. After burning off some energy by the mill, we took the Old Brigham Road trail, an easy wide trail, up to where it meets with Brigham Road. There, we turned down towards the Stairway Loop Trail (which had some moments which were as steep as stairways) and then explored Judy’s Secret Garden Loop with some beautiful views of the pond. We paused for a few moments at Enchanta, a covered bridge/pavilion with seating and a nice view of the water. Then, rejuvenated, we headed back towards the Davis Rd. Trail, which we explored briefly (just long enough to find a geocache) before our little one ran out of gas and sent us back to the parking lot. With about 3.3 miles covered, it was a respectable hike for our daughter who has limitless energy but tends to get bored without a concrete objective. We were impressed by the general cleanliness and upkeep of the park and will return someday to explore the trails we didn’t get to. Another Saturday, another Saturday hike! We had to suffer through some rain for this one, though. 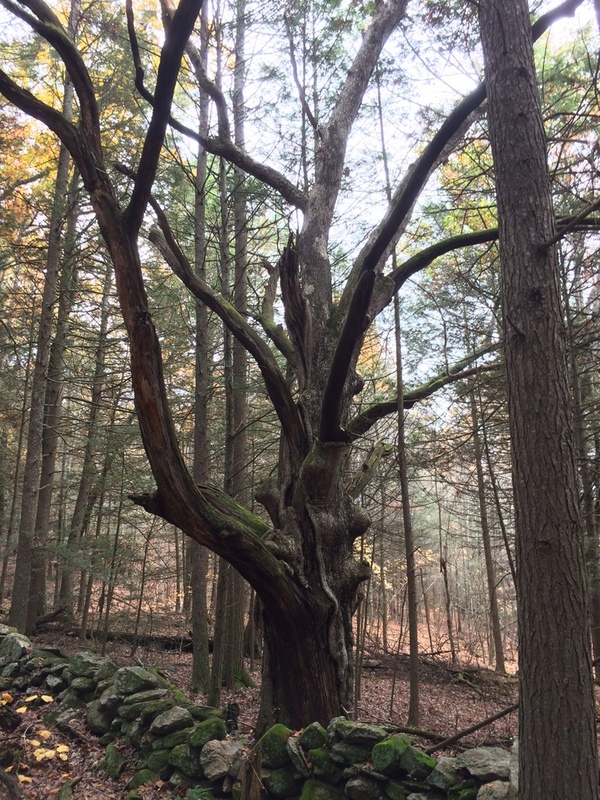 We decided to explore Opacum Woods, a property held in trust by the Opacum Land Trust. 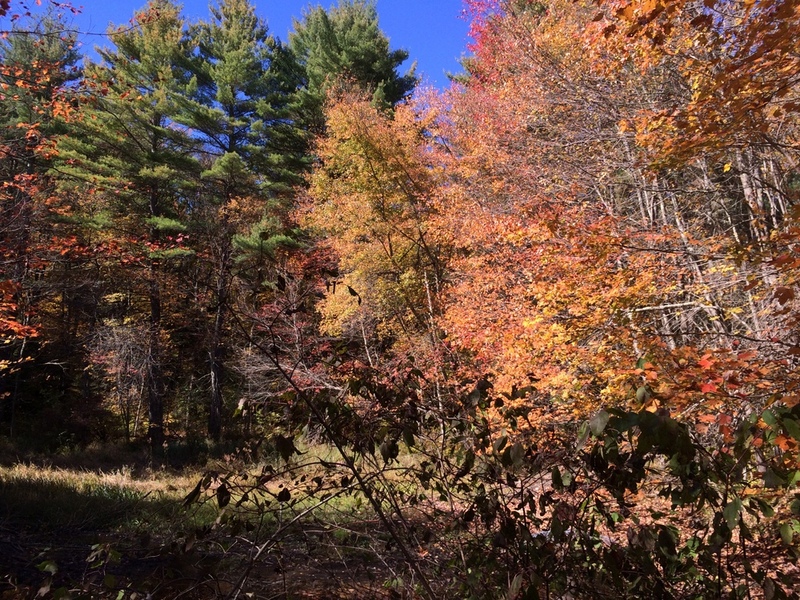 It’s a beautiful wooded area located behind a nice neighborhood in Sturbridge. It fills the corner made by the connection of Interstates 84 and 90. At the trailhead we met some folks from Opacum who were closing up shop; earlier in the day they had officially opened up a new bridge built as an Eagle Scout project and were handing out new trail maps. They gave us one of the new maps; a definite improvement on the one we had picked up when we ran into them at the Big MOE. 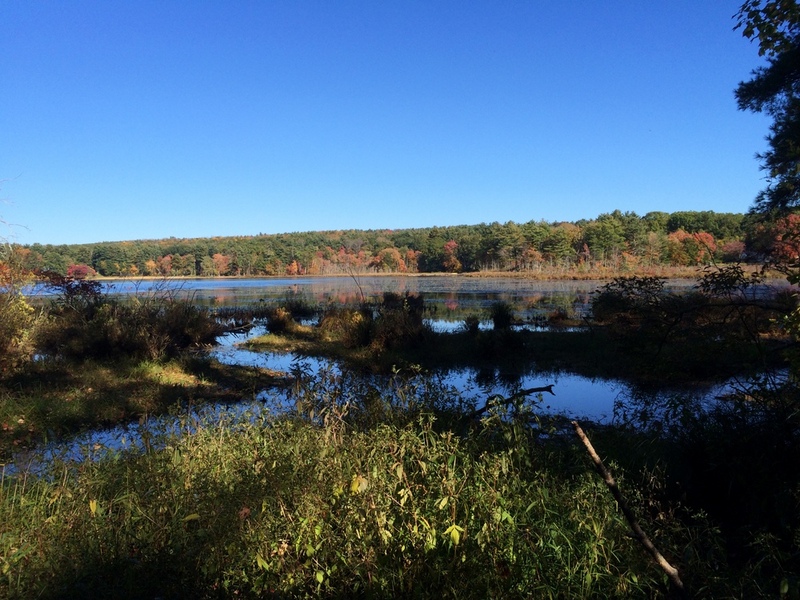 We wanted to get around 3 miles in, so we first walked out to Perry’s Point and admired the foliage by the pond. 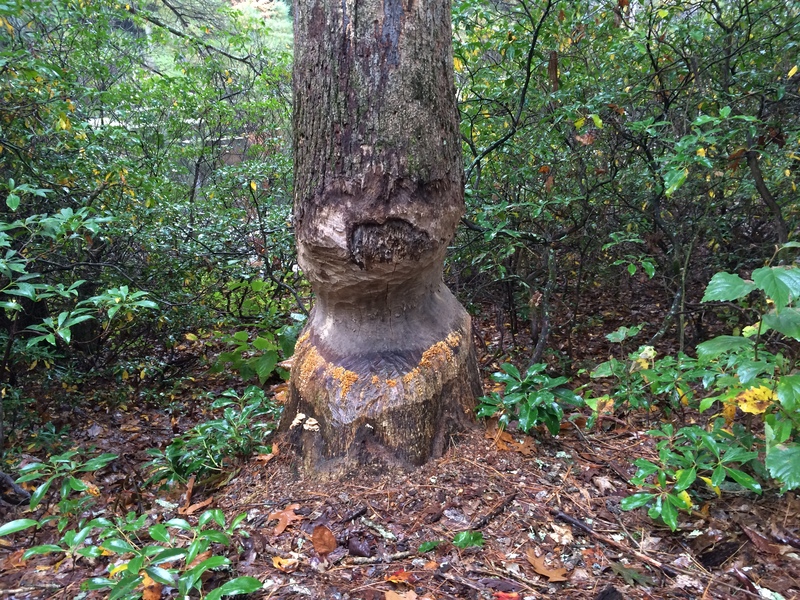 There is rampant evidence of beaver activity here, including many felled trees and a few which are barely hanging on. 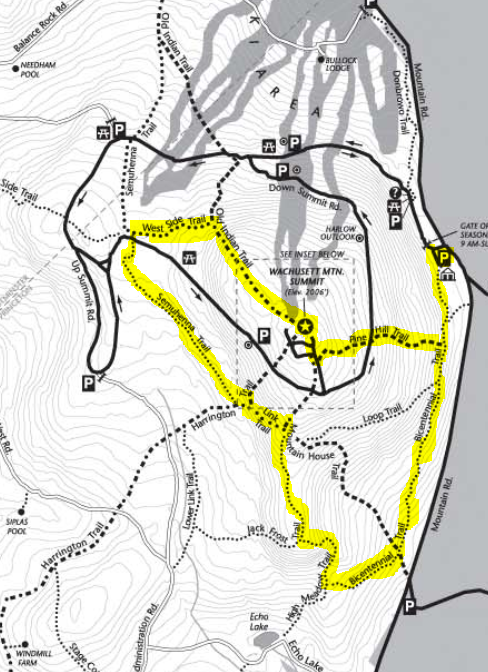 After returning from Perry’s Point, we followed the three trails on the property in one big loop. 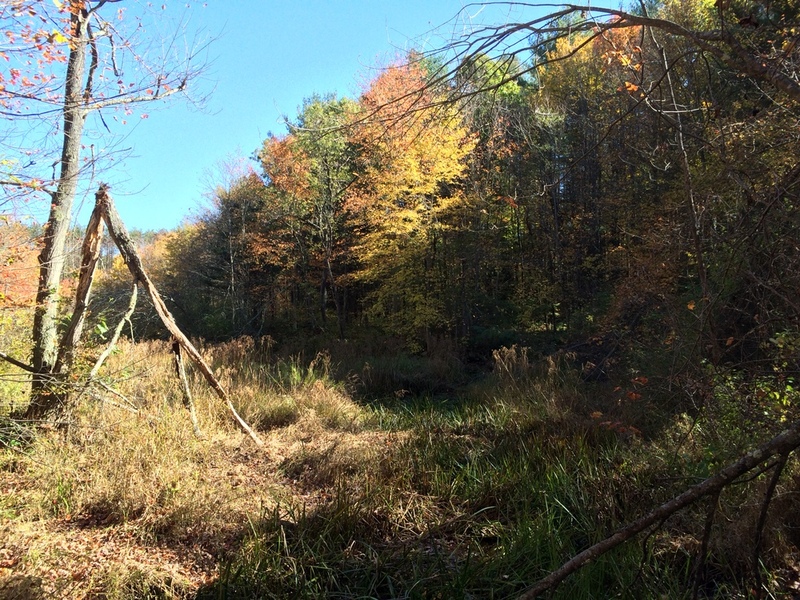 Under a gentle rain we covered all kinds of terrain, from the swampy pond area to steep rocky wooded hills. At all times, though, the background sounds of the interstates accompanied our hike, and honestly sometimes it was a bit distracting. We finished with about 3.3 miles covered, a fine accomplishment for a rainy Saturday. 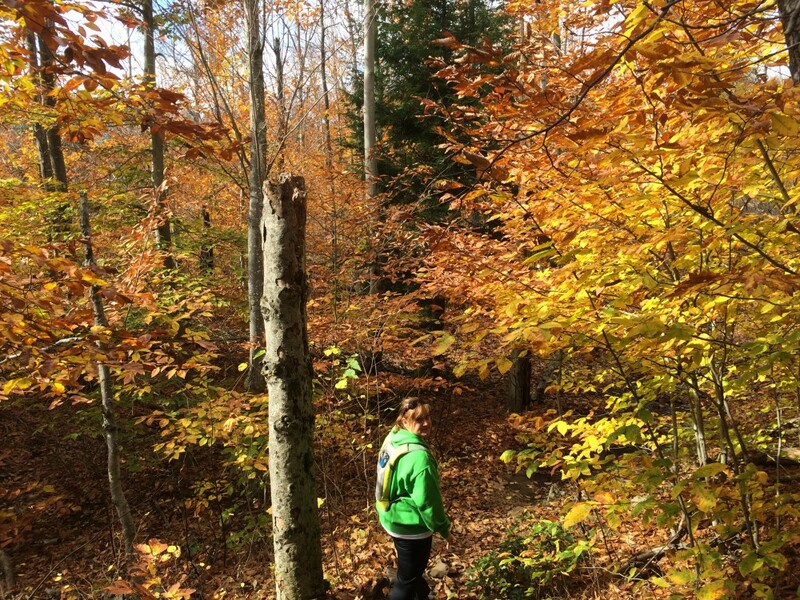 It’s a beautiful hike, with excellent trails which have obviously been lovingly maintained. It’s just unfortunate that the biggest interstate intersection in Central MA is right next door.